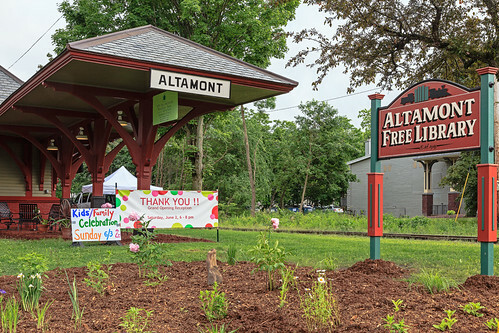 In July 2005, the Altamont Free Library acquired the historic Altamont Train Station for conversion to its new location. The train station, built in 1897 as part of the Delaware and Hudson Railroad, is on the National Register of Historic Places. The Library acquired the wooden Victorian structure, complete with eyebrow windows and cupola, for $250,000. The Town of Guilderland issued a $300,000 bond to cover the purchase price, which the Library will pay back over the coming years. Shortly after the first passenger train passed through what is today Altamont, in September of 1863, the railroad company erected a permanent depot. This building served as a combination freight and passenger station. As the village grew, the depot soon became an unofficial village hall and meeting place. The early station agents were also enterprising businessmen and conducted extensive business from the depot, selling building materials, feed and coal. The first agent, Henry Hawkins, served as the postmaster for Knowersville and the post office was located in the depot. In 1896, the railroad at last agreed to replace the 1864 structure. A contract was awarded to Hiram Schoonmaker, a local builder, to remove the original station some 400 feet south along the tracks and to build a new depot. When completed, in the spring of 1897, it was the newest and most “up-to-date” depot on the entire Susquehana division of the Delaware and Hudson Railroad. Around the turn of the century, the Sand Brothers, Montford and Eugene, used the building to house their feed and grain business. They also ran a brush car sales agency out of the place. In the 1920’s, the structure was the offices and storage facility for Edwin Plank & George Righter’s Feed and Coal business. The towered coal chutes were located between the track and Altamont Blvd. The trains would deliver the coal to the towers in open freight cars with unloading mechanisms in the bottom. The cars would unload the coal onto a revolving deck, which would then bring it to the chutes, and then the coal would be delivered to the village homes. 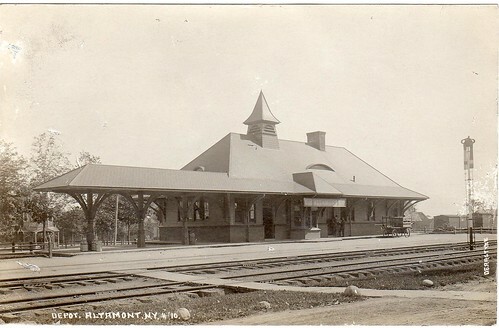 The station continued to serve a large commuter and summer-visitor clientele until the depression of the 1930’s. After that, many of the summer hotels closed, the automobile became the dominant mode of transportation, and the bus lines took over the commuter business. In the 1950’s, the building was leased out to the Albany County Highway Department as offices and storage. 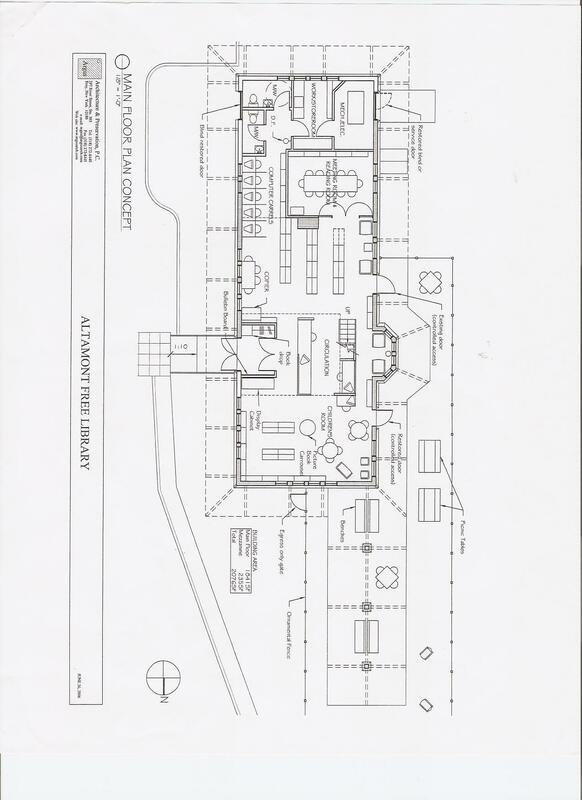 In December 1984, the property was sold to the Altamont Tile Company who erected an addition on the north end of the building and opened an office and showroom. The building was later purchased the TEC Northeast Fire Systems. The last passenger train passed through Altamont on January 24, 1963 after a century of service. Shortly after the station was closed, the village leased it as a home for the Altamont Youth Organization. In June of 1964, the members of the Altamont Planning Association purchased the depot from the railroad and renovated the structure for use as a community center. In 1968, the Village of Altamont purchased the building for use as a village hall and offices. By 1971, the village space requirements and the growth of village services had rendered the depot inadequate and the village consolidated its offices and services into the present village hall/fire station at 115 Main Street. The depot was then sold to private interests who continued the restoration projects begun by the planning association. Capital Campaign Brochure – Information on naming opportunities, etc.